Living in Florida is hard on your skin, especially in areas that take on the sun’s rays daily like your face. Intense Pulsed Light (IPL) treatments reverse the spots, tame redness, and return a youthful glow to your sun damaged face. At Tampa Laser Hair Removal, our specialists will guide you through every step of your IPL treatment. Be confident in your skin again with this state-of-the-art procedure. IPL, also known as photo rejuvenation, delivers intense, broad spectrum light pulses to heal imperfections and invigorate your skin. Administered with a versatile handpiece, your Tampa Laser Hair Removal specialist can accurately target your problem areas. The broad spectrum light used in IPL treatment targets melanin and hemoglobin deep under your skin’s surface. The light is absorbed by both melanin and hemoglobin. When absorbed by melanin, the pigment that is causing those unsightly brown spots, it’s fragmented and broken up, eventually being flushed out of your system. As the light is absorbed by hemoglobin, the tiny blood vessels that have been peeking through your aging skin are broken up and flushed away. At the time of treatment, a cooling gel is applied to your treatment area. This helps to numb the little pain that is involved with non-invasive IPL treatment. Some people do say it feels like a slight snap of a rubber band against the skin. The cooling gel will greatly decrease that feeling, especially if you are sensitive to pain. Clients are out of their appointment in 30-90 minutes and often reapply cosmetics immediately following their procedure. There’s no downtime required, so you can return to work or enjoy the rest of your day pain-free. We recommend 3-5 treatments to enjoy the most benefit possible from IPL treatment. You’ll see improvements in rosacea, dilated blood vessels, sun spots, and age spots over the course of time. IPL is even known to give collagen production a boost. Reduce fine lines and wrinkles while you soften the damage caused by the Tampa Florida sun! 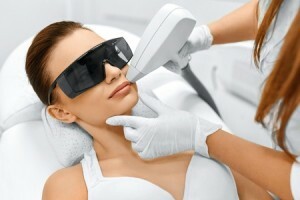 IPL is one of the few facial rejuvenation procedures that actually treats the source of your dull, spotty-looking skin. At Tampa Laser Hair Removal, we take pride in providing a service that is non-invasive and allows your skin to heal from the inside out. Our specialists are trained to customize the wavelength used in your treatment to your specific skin condition. Call Tampa Laser Hair Removal now at (813)-773-0804 to schedule your first IPL appointment. Head into summer loving the skin you’re in!